Built-in 4 LED manual light control Chatting and see each other through the internet with this VGA chatcam. 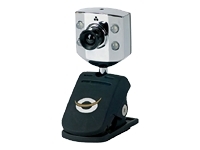 This web cam is compatible with all messenger and chat applications. The microphone is built-in and it is very easy to connect and install the camera. The webcam can be used in 2 different ways: for desktop use by using the included foot or for notebook/TFT screen.